Today the Institute for Nano Quantum Information Electronics (Director: Professor Yasuhiko Arakawa), the University of Tokyo, in collaboration with Fujitsu Laboratories Ltd. and NEC Corporation, announced that they have achieved quantum key distribution(1) at a world-record distance of 120 km using a system with a single-photon emitter(2). These results were generated using an optical fiber quantum key distribution (QKD) system that was newly developed by the three parties. The new system is comprised of two key components. 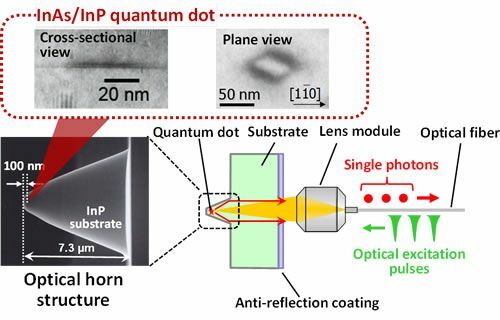 One is a high-purity quantum dot(3) single-photon emitter operating in the 1.5μm band, which reduces the occurrence of simultaneous multi-photon emissions, one of the major limiting factors for long-distance QKD, to one in a million. The other is an optical-fiber-based QKD system optimized for use with single-photon emitters by employing superconducting single-photon detectors(4) with ultra-low-noise characteristics. This single-photon QKD system, which simplifies system operations and management, has now achieved a transmission distance of 120 km. It is expected that this system will bring significant momentum to achieving secure communications that are impossible to eavesdrop on and that cover major metropolitan areas. Single photons in the 1.5μm band are generated by illuminating (exciting) a quantum dot placed in a so-called "optical horn structure"(5). The wavelength of the excitation pulse is tuned to the appropriate energy level of a quantum dot (figure 2). If the time duration of the excitation pulse is long, there is a greater chance of two or more photons being emitted per each excitation. This time, however, using dispersion-compensation technology, the temporal width of the illuminating light was compressed, so as to obtain shorter excitation pulses (see the yellow part of figure 3). By doing so, the probability of emitting multiple photons per one pulse was reduced to one in a million, resulting in the successful creation of a high-purity single-photon emitter having the world's highest performance. Using a low-loss interference system optimized to a communications-wavelength band single-photon emitter that uses a planar lightwave circuit as a platform, which has good practicality proven in operation in the Tokyo QKD Network(6), the researchers built a practical single-photon QKD system that is insensitive to changes in temperature or tensile force that exist in actual optical fiber networks. 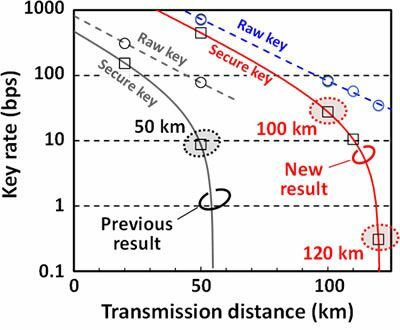 In addition, by using a new superconducting single-photon detector with ultra-low-noise properties, they created a long-distance QKD system (figure 4). The University of Tokyo is known for the excellence of its faculty and students and ever since its foundation many of its graduates have gone on to become leaders in government, business, and the academic world.